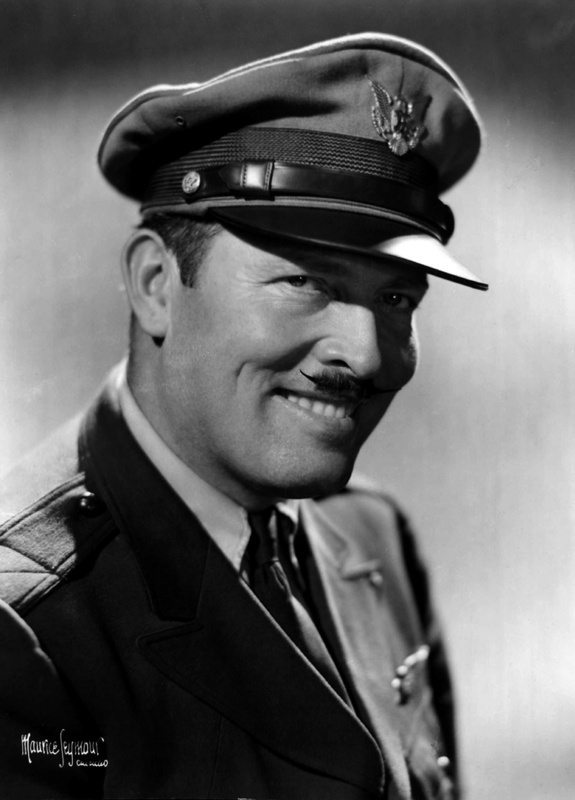 Roscoe Turner, ever the showman, with his impeccable custom uniform and well trimmed mustache. Turner once admitted that he did not like wearing his uniform but used it to stand out and get publicity wherever he went. Roscoe Turner (29 September 1896 – 23 June 1970) was the preeminent aerial showman of the 1930s, and perhaps of all time. 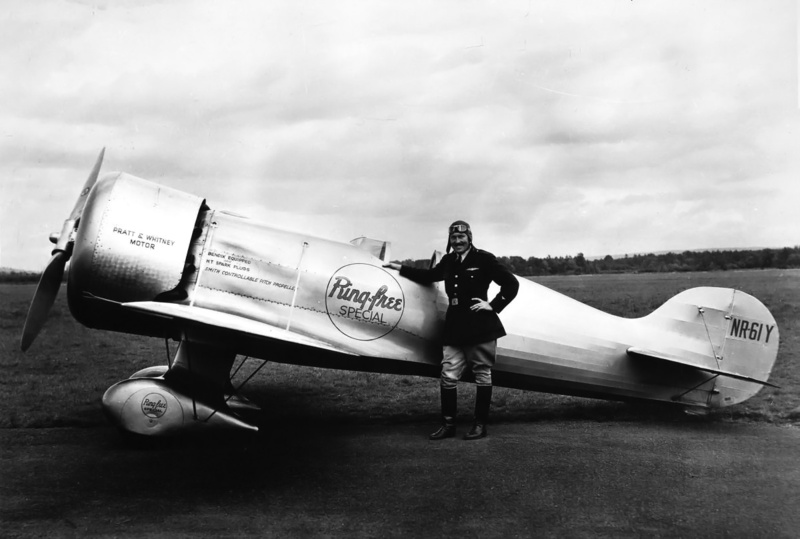 From 1929 to 1930, Turner set numerous cross-country speed records and won many air races. He was awarded the Harmon Trophy in 1933 and 1939 and the Henderson Trophy in 1933, 1938, and 1939. He won the Bendix Trophy in 1933 and the Thompson Trophy in 1934, 1938, and 1939. 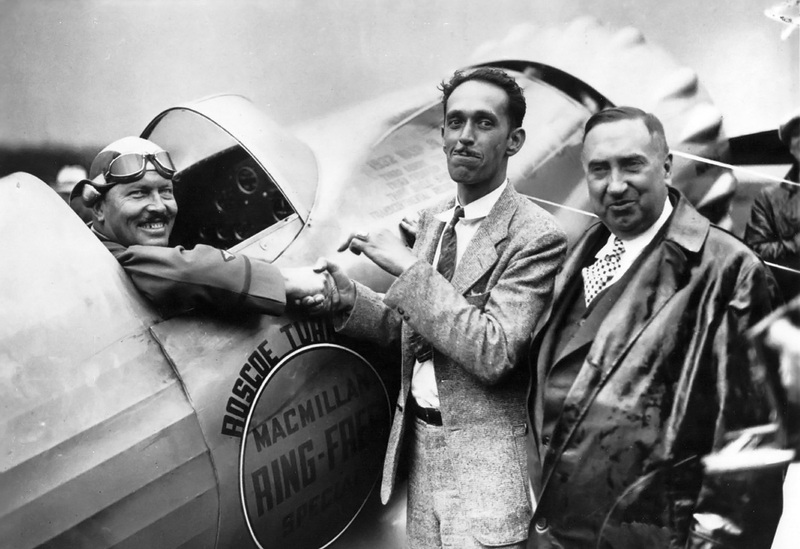 Turner also placed second in the MacRobertson International Air Race from London to Melbourne. To raise publicity while he was flying for the Gilmore Oil Company in the early 1930s, Turner adopted a lion cub and flew with him until he became too large. A lion’s head was the logo for the Gilmore Oil Company, and Turner named the cub Gilmore. Turner retired from air racing in 1939, but continued to be involved in aviation until his death, which, unlike for so many early aviators, was from natural causes. The following was originally from the August 1956 edition of Pegasus, the Fairchild Engine and Airplane Corporation’s magazine. Ten… Nine… Eight… Seven seconds, the clock on the dash panel says, ticking them off. And you sit there in the cramped cockpit and sweat. Waiting for the starter to drop the flag. The tiny racing plane trembles. The propeller clatters. The skin throbs. You’re in No. 2 position, next to the orange job with the taper wing, second from the end of the line. There are nine others, wing-tip to wing-tip, all rarin’ to go. Stinging, snorting little hornets. And you’ve got to fly each one of them besides your own. Because you never know what the other guy is going to do. 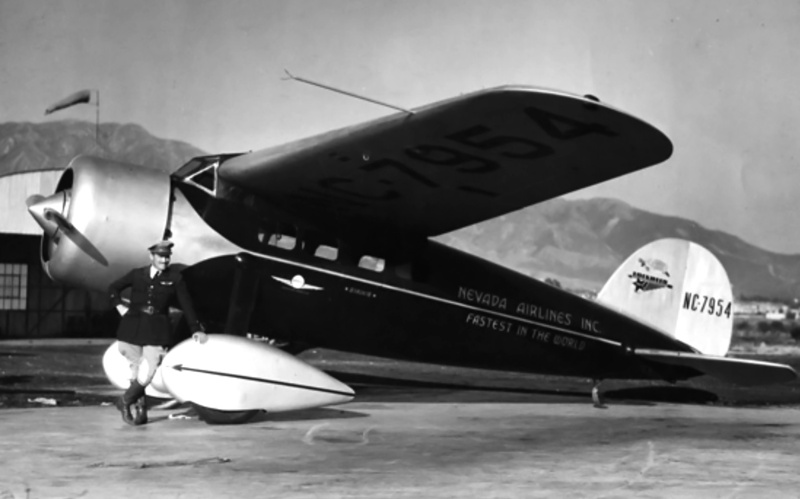 Turner stands in front of the Nevada Airlines Lockheed Vega (NC7954) in which he set various cross-country speed records and flew in the 1929 Thompson Trophy Race. This is the Thompson Trophy Race. The big one. The National Air Races. The one that really counts. Aviation’s “Kentucky Derby.” You’ve got to win. Everything you own is wrapped up in this trim and powerful little racer. Everything. Even your spare watch is in hock. For 365 days, since the race last year, you’ve been getting the ship ready. Wings clipped to cut through the air faster. Engine souped up to get more power. One thousand two hundred horsepower in your lap and a feather in your tail. That’s what it amounts to. Enough to make any aeronautical engineer beat himself to death with his slide rule. For what? For fame and glory and headlines and the prize money. So you can pay off your debts and come back next year. 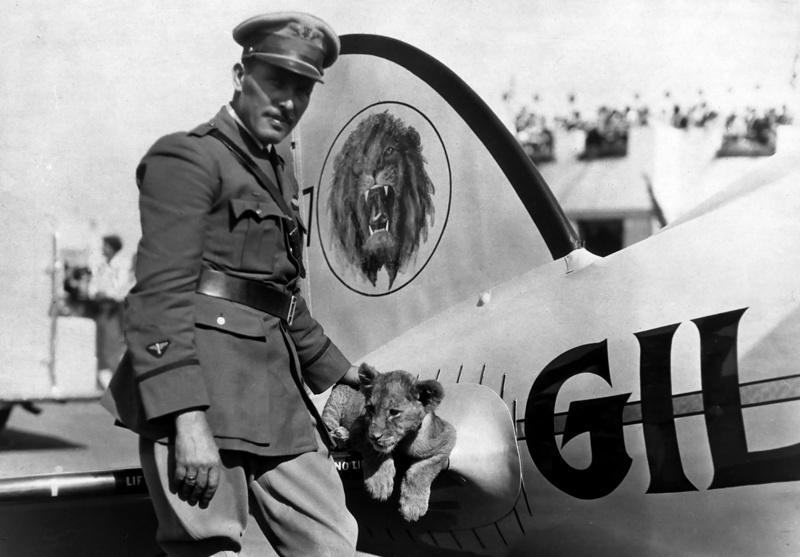 Turner poses with Gilmore the lion cub on the tail of the Gilmore Oil Company sponsored Lockheed Air Express in 1930. Turner made a custom parachute for the lion cub, and the pair flew together until the lion had grown too big (150 lb / 68 kg). Turner funded Gilmore’s care until the lion died in 1952. Gilmore was then stuffed and kept by Turner until he passed away in 1970. 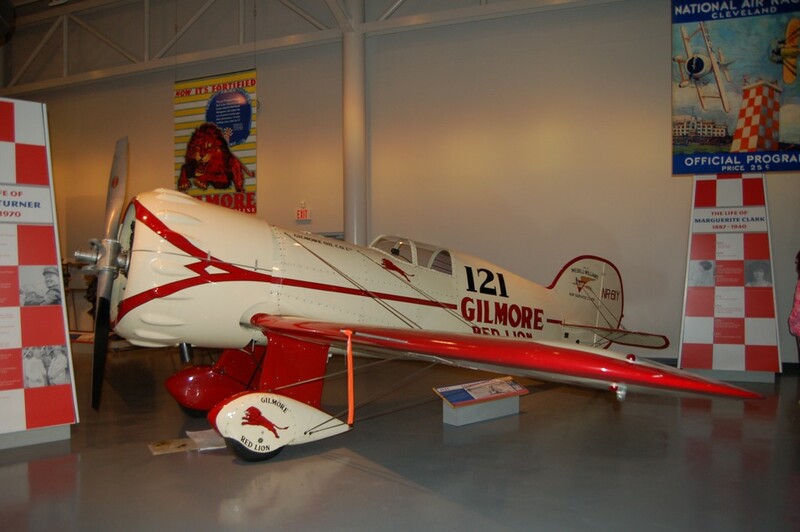 Gilmore is preserved and in storage at the National Air and Space Museum. Check your instruments, fuel gauge. Pressure gauge. Oil temperature. Tachometer. Cylinder head temperatures. Glance at the chronometer. The clock has stopped. No, it’s still running. Six… Five… Four… Why is a second a year? Tick, tick, tick, it sounds like the bong of Big Ben in your ears. Tension, nerves, fear. It drowns out the roar of the crowd. The grandstand; a kaleidoscope of colors. It’ll be a blurred ribbon the next time you see it flash by. See that black and yellow job down the line? Keep your eyes on him. He’s the guy to beat. Get out in front of him and try to stay there. No. 8, that’s him. Number Eight… Number Eight… Beat him… Beat him… The engine sings it. A battle cry. Remember what your mechanic said – “They’re ganging up on you. Look out! They’re going to try and box you in.” Just like they do at a horse race. Turner poses with his Gilmore Oil Company sponsored Lockheed Air Express (NR3057) and Wedell-Williams Model 44 (NR61Y) racer in 1932. 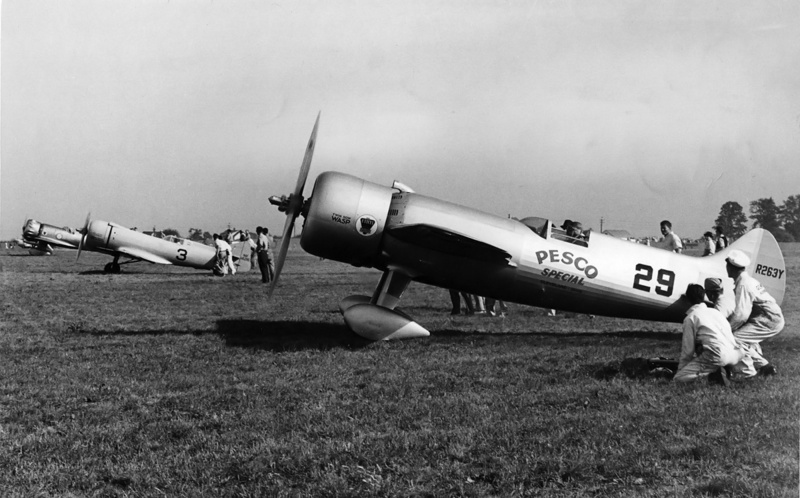 At the time, the Model 44 had its original 535 hp (399 kW) Pratt & Whitney R-985 Wasp Jr engine. 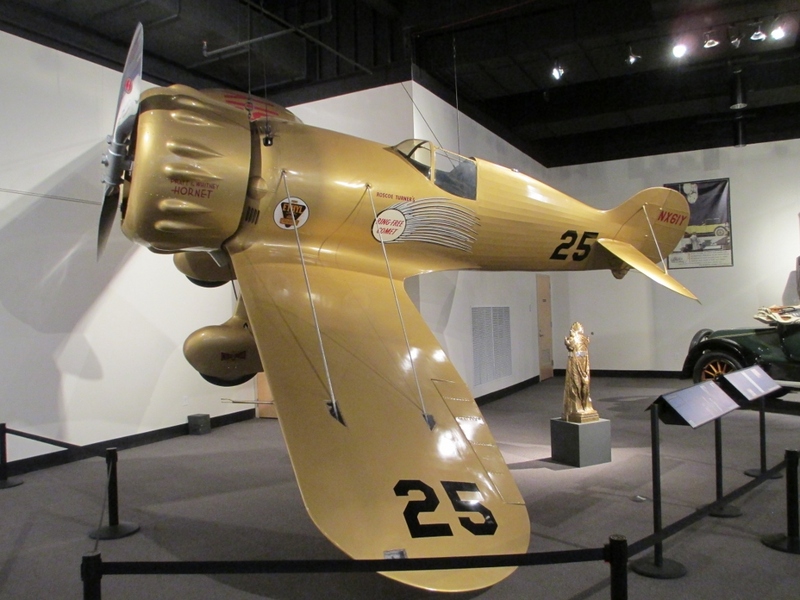 A replica of the racer is at the Wedell-Williams Aviation and Cypress Sawmill Museum in Patterson, Louisiana. Three… Two… One second now to go! Why won’t your feet be still? They’re jumping up and down on the rudder pedals. Dammit! You can’t stop them. And your hands? Sticky, trembling on the stick and throttle. Shaking like you’ve got the DTs. Goggles streaming with perspiration. Your clothes are soaked. They’re soggy. Itchy. Hell fever, that’s what you’ve got. Scared-to-hell fever. You always catch it right about now with one second to go. It’ll go away. As soon as… There’s the flag. Slap the throttle. Werrummm! The ship leaps forward. Your feet stop jumping. Hands? Cold and steady. Now, crouched in the cockpit, this is your world. Nothing else matters. It’s up to you. Faster, faster, faster, shooting across the field. Pull back on the stick. Not too fast. Easy does it. You’re free. The ship leaps forward again, like a shot from a gun. No more ground drag. Too much speed. You’ll rip the wings off if you don’t slow down the propeller. Turner with his Wedell-Williams Model 44 in late 1933. An 800 hp (597 kW) Pratt & Whitney R-1340 Wasp Sr engine has now been installed in the racer. Where are the others? Count ’em… one… two… three… they’re all up. Don’t get too close. One error and it’s curtains for both of you. You’re no longer human. You’re a machine. Every move is timed to the split second… There’s the red roof. Pylon coming up. Left rudder. Left stick. Moving up. Wing down. You’re around. The straightaway. More throttle. The wind whistles in your ears. Brown roof. Big tree. Another turn. Here comes the others. Who’s that on the left wing? He’s cutting in too close. You’ll get his prop wash on the next turn… Here it comes, boy… Hang on! Too sharp. Take ’em wider next turn. Don’t try to cut so short. Let the other guy kill himself. You’re doing all right. There’s the grandstand again. Swoosh! Pull off a strip of tape from the dashboard. That’s how you count the laps. Thirty laps. Thirty pieces of tape. Twenty-nine now… Check it the next time you go by the crowd. The guy will have the big numeral card out. It should read 28. 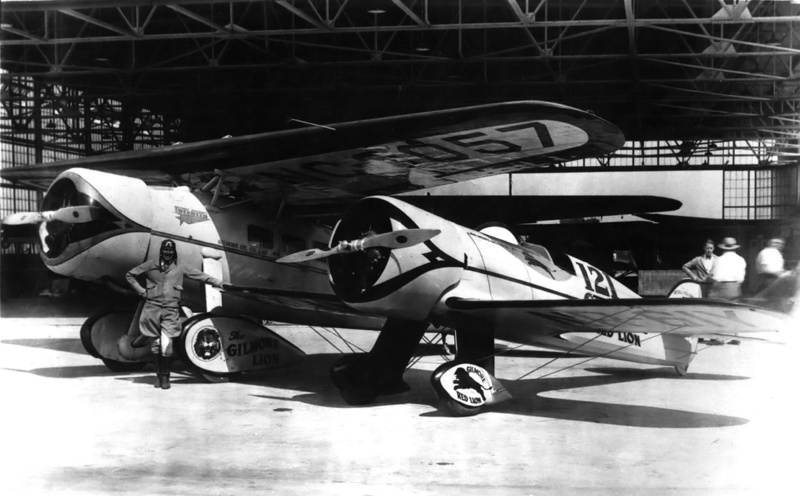 In 1934, this Boeing 247 (NR257Y) was flown by Turner, Clyde Pangborn, and Reeder Nichols to a second place finish in the Transport category of the MacRobertson Race, covering some 11,300 miles (18,200 km). 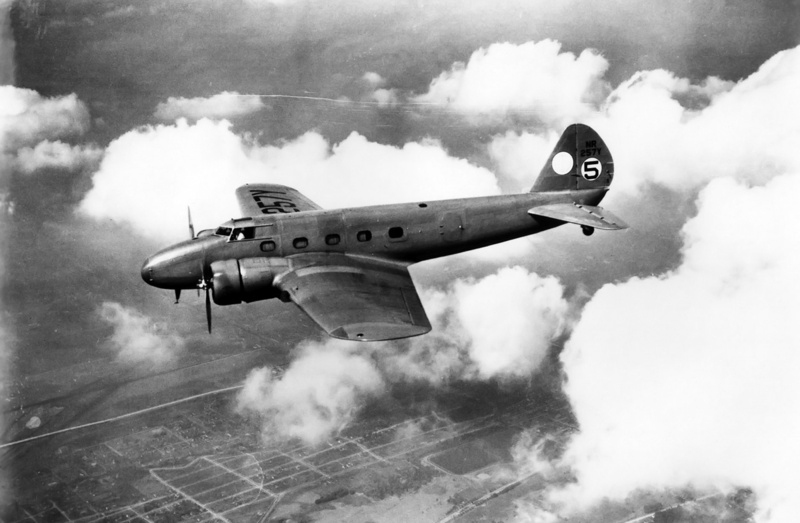 The aircraft was borrowed from United Airlines and fitted with extra fuel tanks in the fuselage. After the race, it was returned to service by United. This aircraft is currently preserved in the National Air and Space Museum in Washington, DC. Where is No. 8? You can’t see him. Red roof again… turn… straightaway… throttle… brown roof… big tree… pylon… The grandstand. Okay, it says 28. There he is! Just ahead. You’re gaining on him. Faster, faster… Pour it on. Pray this thing will hold together… Red roof coming up… Try to cut it real short this time… Take the chance… Maybe you can get him on the turn… NOW… Wing down deep… Snap back… jerk… Shake, tremble, roar! But you made it. There’s nobody in front of you. Instruments?… Oil pressure… Supercharger… Gas… Speed… Okay… If they only stay like that. Remember what happened last year- when the supercharger blew. It was only doing 2000 rpm then… Now it’s doing 3000. You improved it. But that much? Pylon. Grandstand. Tape. Round and round going nowhere. Brown roof. Red roof. Big tree. Straightaway. Pylon. Zoom, zoom, zoom. Wing up. Wing down. Level off. More pylons. More trees, more roofs. It’s hot. Like an oven. Is something on fire? Glance around? No, don’t, you mustn’t. At this speed you can’t take your eyes off what’s coming up ahead… Grandstand… Tape… There’s one piece left. One more lap. You’re still out in front. If you could only look back and catch that number card for a recheck. It was so blurred. Maybe you missed a pylon. Maybe they’ll disqualify you. No, not that, please. And let’er hang together another two minutes. Turner and Benny Howard shake hands as Vincent Bendix looks on after the 1935 Bendix Trophy Race. Turner finished 23 seconds behind Howard in the cross-country race. Turner’s Wedell-Williams Model 44 racer now had its final power plant, a 1,000 hp (746 kW) Pratt & Whitney R-1690 Hornet engine housed in a close-fitting cowling. You’re shaking again. You can hardly control the ship after she’s on the ground. Your heart beats louder than the engine. Uniform soaked, sopping wet. Hands tremble. Knees buckle as you climb out to meet the reporters and photographers with a big, forced smile… Headache. Muscle ache. Exhaustion. Oh, for a great big soft bed. Air racing is like that. It’s the toughest test of all on men and machines. I know. For ten years I was pushing pylons in the Thompson. For ten years I was smashing records across the country in the big Bendix Transcontinental. Three times winner of the Thompson, many times loser. But it gets in your blood, and it stays. It’s the most dangerous profession in the world. Turner applies power to the 1,000 hp (746 kW) Pratt & Whitney R-1830 Twin Wasp engine in his Turner-Laird RT-14 Meteor racer (Race 29, NR263Y) at the start of the 1938 Thompson Trophy Race in Cleveland, Ohio. Beyond the Keith Rider R-3/Marcoux-Bromberg Special (Race 3) flown by Earl Ortman is Turner’s Wedell-Williams Model 44 (Race 25) flown by Joe Mackey. All of these aircraft are preserved: the Meteor is in the Steven F. Udvar-Hazy Center of the National Air and Space Museum; the Model 44 is part of the Crawford Auto-Aviation Collection in Cleveland, Ohio; the R-3 is in the New England Air Museum in Windsor Locks, Connecticut. This entry was posted in Air Racing and Records on 28 June 2015 by William Pearce.